This little toddler bedroom has been a long time in the making. 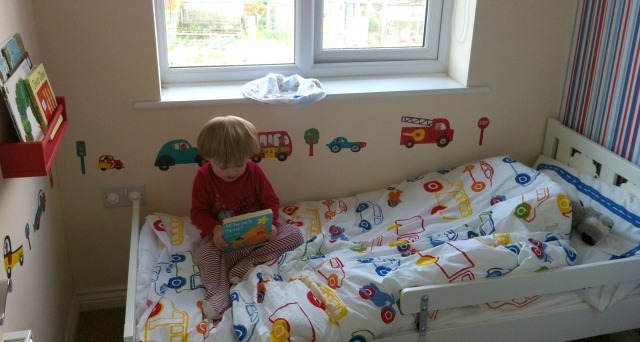 We first moved into this new house well over a year ago and moved him into the second bedroom, undecorated, with just a few space stickers to brighten up the walls. We had always planned to decorate his room this summer but when we discovered that I was expecting twins we had to decide to move Lucas into the smaller bedroom. 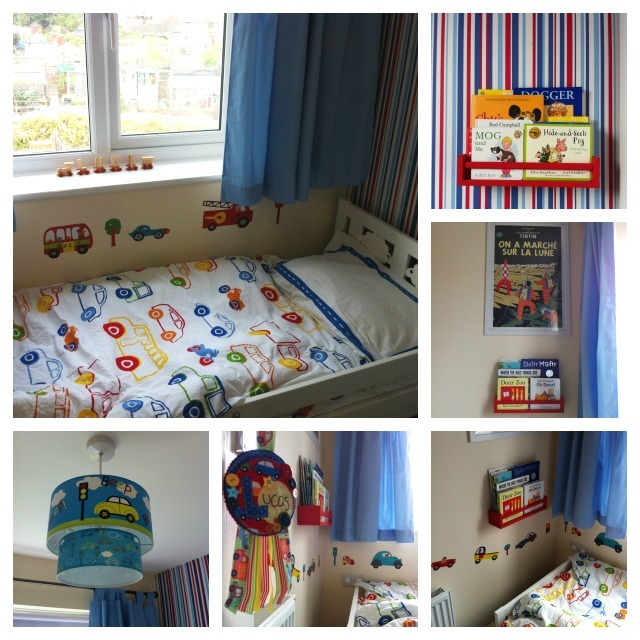 I wanted to wait until we were ready for the transition from cot to big bed so towards the end of the summer holidays we started to get his new room ready. I didn’t really have a theme in mind but I’d started a Pinterest board to collect my favourite ideas and I loved the idea something quite light but with bright colour accents. When I saw this duvet in Ikea I firmly decided on a vehicle theme; the duvet was exactly what I wanted from the room, white backgrounds with bright primary colours and this little toddler just loves his cars. We went for some stripy coloured wallpaper from Wilkinson’s on one wall but kept the other walls plain. The room has small dimensions so I spent a long time hunting out the perfect bed and wardrobe within our budget. Ikea came to our rescue again and we went for the Kritter toddler bed and chose our own combination from the Stuva range. I also spied these fabulous spice racks come bookshelves on Pinterest and they have been perfect. Ideally we could do with dozens of them but I rotate the books on display from the main bookcase. I know for some people (my husband included) Ikea is just hell on earth but I really think it’s great and for a reasonably priced children’s range it can’t be beaten. I added a lampshade and a few storage boxes from Dunelm Mill, wall stickers from eBay and my friend bought him the lovely door rosette. My mum brought the Tintin poster back from France and the little wooden train from Spain, my Nana added the finishing touch with the name plate from Italy. I love all these little handmade touches that have been bought by family and friends, they add that special personal touch to the room. I think it is a nice toddler bedroom that will also grow with him as he gets older. Ideally I would like to add a few more shelves, prints and I’m trying to pick out some photographs to add to the walls. Overall I couldn’t be happier, we were on a tight budget so I’m pleased that it looks how I hoped it would. Best of all Lucas absolutely loves it; he settled into it no problem and some mornings while we are getting ready I find him snuggled on his bed with a book and I know we’ve made this little room his own.